Finally, A Patriot’s Program for Children! As I entered my greatroom yesterday, I was initially upset that my children seemed unusually glued to the television (we got rid of cable months ago, over great concern over the indoctrination of our children by the Main Stream Media). . .however, once I took a closer look at the content they had seemingly absorbed into, I felt great pride and gratitude. My children had found a new program on the Instant Queue on Netflix. . .the name of the series: Liberty’s Kids by Jill Anderson. As I paused the program, my children excitedly told me how they had stumbled upon this program by searching “Tea Party” on Netflix. I learned that they had been doing this religiously on a weekly basis, in their ever growing desire to become part of history, via grassroots activism, by educating themselves on the history of our Forefathers. I immediately sat down with them, and they eagerly skipped back to the first episode “The Boston Tea Party“, so I could watch the entirely of the program with them from the beginning. Benjamin Franklin enlists the help of young people to record the happenings leading up to and during the Revolution for his newspaper the Pennsylvania Gazette. First, there is a James Hiller, a patriot who tends to act before he thinks and is, at times, too quick a judge in his search for American heroes. Next is Henri, a French orphan who’s only quest is for food. Lastly, a young woman named Sarah Phillips joins the team; the daughter of an ex-English general with strong views opposing slavery. Together, they travel the colonies witnessing the sacrifices made for freedom. 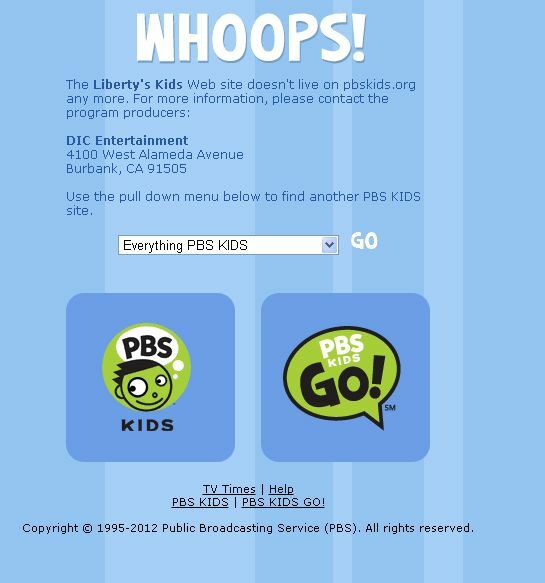 Liberty’s Kids’ first episodes first launched in 2002, Long before the birth of the Tea Party movement, and ran a full 40 episodes, targeting children ages 7-14 with teachings on the origins of the United States of America. I have found no further explanation as to why the program was dropped. Id did find, however, that the DVD’s can be purchased (so once it’s yanked off of Netflix, my children can continue to watch and learn from this great program). I’m very excited to continue watching this with my children, and will be documenting any errors, need they be found. **I only say this because of the connections to both PBS and funding by the U.S Department of Education. . .so odds are, the show may become slanted as the episodes continue.